Aerite™ AB120 feed blower units are commonly matched with our AeroSpreader™ S80 dry pellet feed broadcasters to create a high performance feed pellet broadcasting package. Trouble free long life operation is assured with the UV stabilized polyethylene blower housing well-suited for tough outdoor and corrosive work environments. The blower’s simple assembly design allows the unit to be easily separated from the power plant and re-installed on any comparable-sized motor assembly. Both the inlet horn diameter and carefully shaped internal impeller tip clearances are optimally designed to provide high static pressure at very low operating noise. To reduce wear and maintenance costs associated with pulleys and belts the Aerite™ AB120 Blower is produced as a direct drive blower unit with the associated benefits of compact size, lightweight, and portability. Smooth operation at high speed. 9 mm (0.75 in) hub and 4.7 mm (0.1875 in) diameter shaft key. Dynamically balanced. Cast Almag® 35 cm (13.75 in) diameter. Machined face with various mounting bolt patterns to allow for alternate power sources. 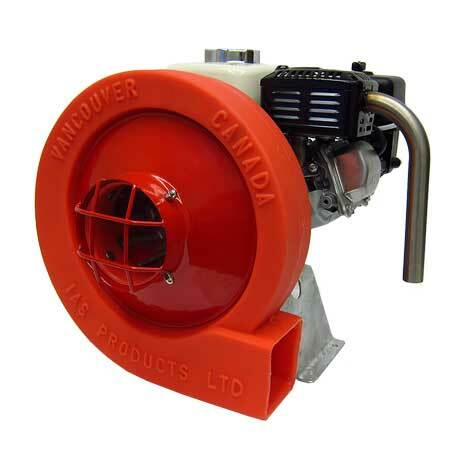 13 cm (5 in) diameter with fitted powder-coated steel inlet horn and safety screen. 7.6 cm (3 in) diameter. 3 Kw (4 HP) Gx120 Honda power plant c/w low oil alert. Standard machined shaft and backing plate bolt patterns provide for alternative gas, diesel, and electric power plants.